The Lae War Cemetery is one of the major WW11 cemeteries in the country apart from Bomana (Port Moresby) and Bitapaka (Rabaul). Immaculately maintained by the Commonwealth War Graves Commission, the Lae War Cemetery contains 2,818 Commonwealth burials of the Second World War, 444 of them unidentified. The majority, over 2000, are from Australia with others from Great Britain, India, and Papua New Guinea. They now rest peacefully in a picture of tranquility in the tropical greenery of the Botanical Gardens. At dawn on ANZAC Day each year, the Lae community comes together to remember the many men who gave up their lives, to protect their countries and their people. A visit to Lae would not be complete without a visit to the cemetery, which is located next to the Botanical Gardens in the centre of Lae. It is also a very emotional and moving experience. In the early months of 1942, Japan enjoyed a crushing superiority in the air, and it was Lae and its neighboring airfields that were the objects of the first Japanese attack on New Guinea. Lae and Salamaua were bombed on January 21, 1942, by 100 planes, but the land forces did not enter the territory until March 7, when 3,000 Japanese landed at Lae. There were landings too at Salamaua, followed on July 21 by further landings at Buna and Gona on the east coast in preparation for a drive through the Owen Stanley Mountains across the Papuan peninsula to Port Moresby. The vital stage of the New Guinea campaign dates from that time. Lae became one of the bases from which the southward drive was launched and maintained until it was stopped at loribaiwa Ridge, a point within 60 kilometres of Port Moresby. Lae War Cemetery was commenced in 1944 by the Australian Army Graves Service and handed over to the Commission in 1947. It contains the graves of men who lost their lives during the New Guinea campaign whose graves were brought here from the temporary military cemeteries in areas where the fighting took place. The Indian casualties were soldiers of the army of undivided India who had been taken prisoner during the fighting in Malaya and Hong Kong. The great majority of the unidentified were recovered between But airfield and Wewak, where they had died while employed in working parties. Of the two men belonging to the army of the United Kingdom, one was attached to 219th Australian Infantry Battalion and the other was a member of the Hong Kong-Singapore Royal Artillery. The naval casualties were killed, or died of injuries received, on H.M. Ships King George V, Glenearn and Empire Arquebus, and the four men of the Merchant Navy were killed when the S.S. Gorgon was bombed and damaged in Milne Bay in April 1943. Before the First World War, north-eastern New Guinea and certain adjacent islands were German possessions, and were occupied by Australian Forces on September 12, 1914. Several cemeteries in New Guinea contain the graves of men who died during that war. There is one such grave in Lae War Cemetery, brought in from a burial ground where permanent maintenance could not be assured. The Lae War Memorial, which stands in the cemetery, commemorates more than 300 officers and men of the Australian Army, the Australian Merchant Navy and the Royal Australian Air Force who lost their lives in these operations and have no known grave. Casualties of the Royal Australian Navy who lost their lives in the south-western Pacific region, and have no known grave but the sea, are commemorated on Plymouth Naval Memorial in England along with many of their comrades of the Royal Navy and of other Commonwealth Naval Forces. 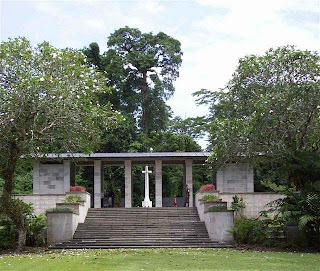 LAE WAR CEMETERY was commenced in 1944 by the Australian Army Graves Service and handed over to the Commission in 1947. It contains the graves of men who lost their lives during the New Guinea campaign whose graves were brought here from the temporary military cemeteries in areas where the fighting took place. The Indian casualties were soldiers of the army of undivided India who had been taken prisoner during the fighting in Malaya and Hong Kong. The great majority of the unidentified were recovered between But airfield and Wewak, where they had died while employed in working parties. Of the two men belonging to the army of the United Kingdom, one was attached to 219th Australian Infantry Battalion and the other was a member of the Hong Kong-Singapore Royal Artillery.